The All Black centre formed a formidable partnership with Mathieu Bastareaud. ALL BLACK CENTRE Ma’a Nonu enjoyed a winning Top 14 debut for Toulon on Saturday, but it was unheralded scrum-half Eric Escande who took all the plaudits for guiding the star-studded team to a 53-16 rout of Agen. But it was the all-round game management and kicking skills of the much slighter figure of Escande, 23, that impressed, albeit behind a dominant pack, with an ever-eager backline outside him in an expensively assembled team boasting top players from eight different countries. “It was good,” said Nonu, capped 103 times by the All Blacks, with whom he has won two World Cups. “It’s a beautiful crowd out there, good fans. It’s my first game and I felt a bit rusty. Agen fly-half Burton Francis traded an early penalty with Escande before Toulon lock Romain Taofifenua leapt over for the opening try from close range for the home side, the first of five converted by Escande. Agen kept in the game with a second penalty by Francis, but Toulon skipper Juan Martin Fernandez Lobbe was driven over from a lineout after Matt Giteau spurned a shot at the posts to go for the corner. Francis nailed his third penalty as a lack of precision from Toulon allowed Agen to head into the half-time break just 17-9 down. Toulon’s forward power showed once again in the second period, English flanker Steffon Armitage driven over in exemplary style from another penalty touch. The visitors, however, hit straight back with an outstanding try through South African centre Johann Sadie. A fumbled line-out take by Toulon’s Springbok No 8 Duane Vermeulen was spun wide, Sadie giving before receiving the final pass and riding tackles from Australian pair Drew Mitchell and Giteau to score a fantastic try, converted by Francis. After 15 phases lasting more than two minutes, Toulon nabbed an attacking bonus point when Delon Armitage crossed in the corner after a smart floated pass from Wallaby wing James O’Connor. A creaking Agen defence failed to cope when O’Connor linked up with replacement Bryan Habana, Giteau turning provider for Mitchell to run in a fifth try. There was further woe for Agen when their New Zealand sevens winger George Tilsley was yellow carded for upending Habana with 20 minutes to play. But should Nonu also have seen yellow for this no arm clean out on Agen’s William Demotte? Immediately, Toulon turned the screw, Escande’s clever chip allowing Habana to score unmarked. Escande was then on hand with a deft grubber that rebounded off the opposite corner flag for Mitchell to get a hand on for his second try. Toulon were awarded a penalty try in the dying moments before Agen claimed a consolation try through full-back Mathieu Lamoulie, converted by Francis, on the full-time buzzer. Despite being down to 14 men in the closing stages after Australian prop Sekope Kepu was sin-binned, Bordeaux scored a sensational try when 35-year-old South African scrum-half Heini Adams finished off a 50-metre move. Genia’s first outing for the Paris giants ended with him being replaced just after the hour mark. Email “Ma'a Nonu makes explosive start with Toulon ahead of Leinster clash”. 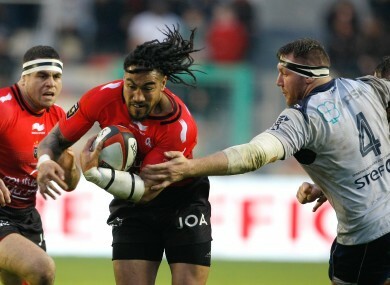 Feedback on “Ma'a Nonu makes explosive start with Toulon ahead of Leinster clash”.